On the 22nd Sunday of Ordinary time we are back in Mark. The lectionary continues where it left off before our five week sojourn in John on the Bread of Life. As is so often the case, the Revised Common Lectionary leaves out some bits of the passage so it looks like three short readings (Mark 7:1-8, 14-15, 21-23). Maybe it was because they didn’t want us to see Jesus getting testy with the Pharisees and scribes (7:9-13), or to hear him talking about pooping (7:17-20). Or maybe they wanted to make sure the passage read in worship didn’t seem to go off on tangents. The Pharisees and scribes complain because some of the disciples don’t wash their hands before they eat. Jesus turns it around and complains that the Pharisees and scribes put too much emphasis on human traditions and neglect the bigger parts of God’s law. Jesus draws a big distinction between what does and doesn’t “defile” a person: Stuff from outside doesn’t defile us. Only stuff coming from inside us defiles us. I have little to say about the initial confrontation scene. The Pharisees and the Scribes thought it was maybe kind of gross that Jesus’ followers didn’t wash their hands before eating. Mark explains, to a community who apparently did not know of such things, that the Jews not only washed their hands regularly but also their dishes and their pots and pans. These practices Mark calls “the tradition of the elders” (7:3), something so terribly misguided that the Pharisees and scribes would toss it in Jesus’ face (7:5). Frankly I have this confrontation regularly with my kids. Fortunately they have not given me the argument that they are just being like the early Christians. Even if basic hygiene and food safety were on the Pharisee’s side, Jesus makes it a teaching moment. The Pharisees and scribes, Jesus says, emphasize human tradition to the neglect of weightier matters of biblical law. This is where the part of the text omitted by the lectionary could help us out: Jesus is saying that an overemphasis on human traditions, religious and ceremonial traditions in particular, can lead people to forget such important items as honoring their parents. What he says implies other parts of the law too: like caring for the poor, the widow, the alien. But the point is clear: we are supposed to pay close attention to what God has already said is important. Like in the Ten Commandments. It is a moment worth pausing on, if only because much of the Christian world has misconstrued it, at least in recent times. By Jesus’ reasoning, human traditions can be weighed lightly, while the laws of God need to be taken very seriously. It often appears we think he meant that human tradition can be jettisoned completely and the laws of God can often be jettisoned completely as well. Am I just getting snarky here? In many corners of my Protestant world, almost anything that is judged to be “human tradition” can be rejected. We’ve been doing this for centuries. The point Jesus really wants to get across, though, is that there really are some things that can defile a person. It isn’t about religious ritual, and it isn’t about personal hygiene. Defilement comes from immoral and unethical behavior. Perhaps more evocatively, defilement comes from our inner states, our attitudes and thoughts, that lead to that behavior. It’s the kind of moral list making that I associate more with Paul than with Jesus. But the interesting thing is thinking about the kinds of items these are. Some come straight from the Ten Commandments. Some foreshadow Christian thinking of centuries to come. Thinking of centuries to come? Glad you asked. In the fourth century Evagrius of Pontus, one of the most thoughtful of the Desert Fathers, created lists of the “Eight Thoughts.” These were the habits of mind that led to bad behavior. I think Evagrius must have been thinking of this passage of Mark. He was convinced that our inner state mattered — that we need to find ways to master the wayward tendencies of our thinking. If we don’t discipline our thoughts, our greedy, prideful, lustful thoughts will lead us to all kinds of really defiling actions. Ah, yes. Discipline. Living a truly Christian life will start with discipline within, learning to think truly — in tune with the love and mercy and purity of Jesus who is the Truth. When good things are going on inside us, then good things will happen through us, outside of us. Then we won’t need to feel our actions are defiling us. 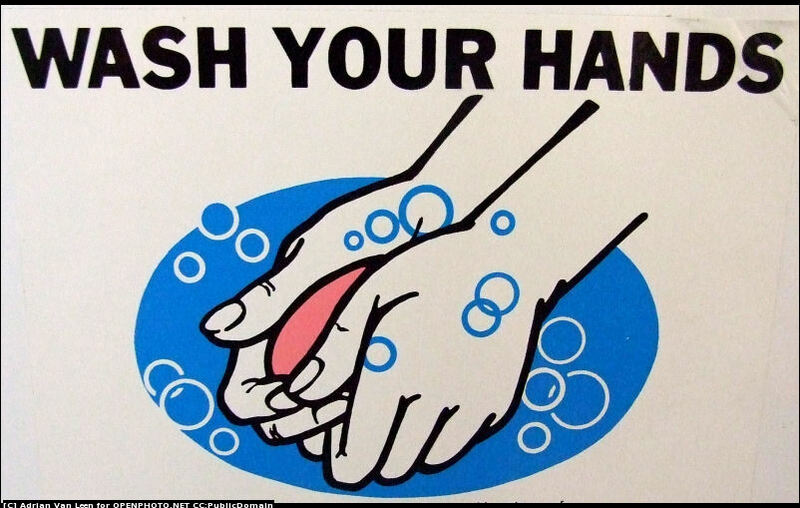 But really, washing your hands before eating is still a good idea. My Monday Meditations are a personal exploration of the Gospel text assigned in the Revised Common Lectionary for the coming Sunday. I hope you enjoy them, whether as a devotional reading or as a conversation partner as you prepare a sermon. I’d love to send these, and all my new articles and announcements, straight to you by email. Just scroll down to the black box with the orange button and we’ll make it happen. Yes, the risk of talking to the kids about what’s actually in the Bible is that they will bring it up to their advantage. However, this is also the great thing about it, since they engage with the real faith rather than the “Be good! Be nice! Be obedient!” version. Was the Silent Night thing added in the new FOG? Or was it one of the things they dropped? Keep me posted.